Most Lab owners will realise that a section called Labrador Retriever Behavior Problems is going to be a busy part of the website! It’s not that Labrador dogs are especially badly behaved; it’s just that their general sense of fun and mischief tends to get them into a lot of trouble. All of which leaves their owners exasperated, flaked out and undecided whether to laugh or cry! All course many Labrador Retriever behavior problems are really a matter of interpretation. For example; my Labs think it is perfectly acceptable to dig up what’s left of my lawn. I, on the other hand, think differently. I think it’s acceptable, and also very funny, that the dogs like to pounce on my wife and help her clean her ears. Lynn, on the other hand, doesn't appear to really appreciate being pinned to the floor by a couple of Labs who seem to be able to generate more drool than a whole battalion of St Bernard’s. But, I would think that there are certain behavior problems of a Labrador Retriever is that we will all recognize as something that needs to be sorted out. Excessive barking, chewing and pulling on a lead are all common issues that we would all want resolving if they effected our dogs. 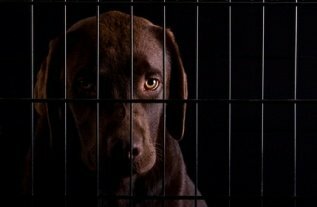 Similarly, disobedience and aggression are just some of the other issues which could effect Labradors and their owners. I believe that Labrador dogs are guaranteed to give their owners more fun and pleasure than any other breed of dog (but then I’m biased). But most breeds of dog will only cause minor or mild problems for their owners and those problems are almost always solvable. A little patience and common sense may be required but I’m sure we all have those qualities. Most behavior problems can be sorted before they even become an issue by training at the puppy stage and by socializing with other dogs. That said of course, if there is a problem with behavior than it is always best to get it sorted out sooner rather than later. Labrador dogs are usually very easy to train. Of course there will always be exceptions but, in general, behavioral problems in Labs can be rectified. The benefit of a well behaved dog to both the Lab and owner is huge; owning a dog should be a pleasure and the key to that id not only having an adorable and loving Labrador but also a (relatively!) well behaved one.